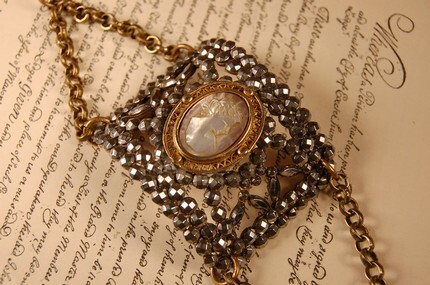 This stunning bracelet centers around a Mother of Pearl cameo that is framed by a golden filigree setting. 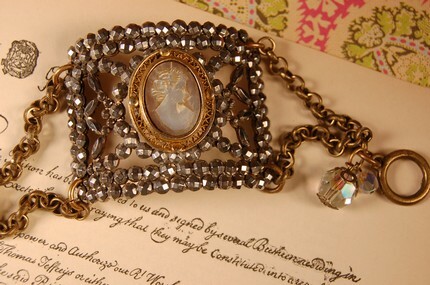 The cameo is carved from soft pink/grey irridescent shell.It sits on a turn of the century Cut Steel Buckle originally marked France [on the buckle bar since removed]. The sparkling buckle, is slightly curved to hug your wrist. 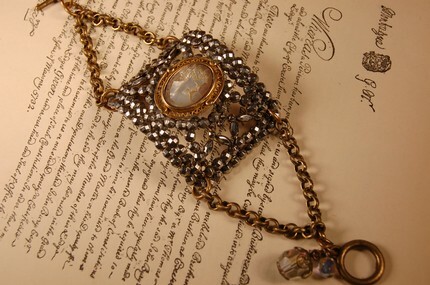 Brass etched chain, a ring toggle, and vintage aurora Austian crystal charms finish the piece. Bracelet measures 7 1/4 in. Buckle is 1 3/4 in.x 2 1/2 in.